CooperVision is one of the world’s largest manufacturers of contact lenses for Canada and the world. In fact Coopervision, has developed a strong reputation for developing and producing high quality contact lenses that provide unrivaled levels of comfort and ease of use. CooperVision’s range includes some of the most well-known contact lens brands such as Avaira, Biofinity, Biomedics, Frequency, Clariti and Proclear, as well as coloured contact lenses from Expressions. Each and every one of these great brands offers you all the benefits of CooperVision’s commitment to contact lens innovation. Amongst CooperVision’s range you will not only find spherical, toric and multifocal lenses, but even toric multifocals to correct both presbyopia and astigmatism simultaneously. No one has more options that Coopervision. Buying contact lenses online with us here at Contactsforless.ca ensures that you will always get a great price on your contacts and great service from our amazing team. 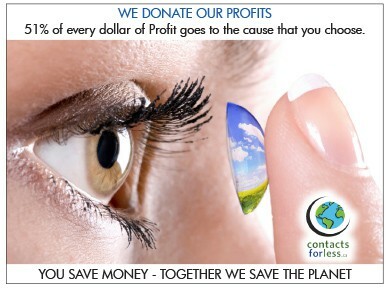 Plus we give away 51% of our profits to help save the planet. Now how cool is that?